Kraft is offering B1G1 FREE Minor League Baseball tickets again this season! 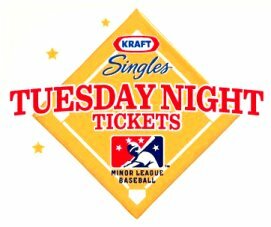 All you have to do is bring a Kraft Cheese wrapper to the box office on any Tuesday night to a Minor League home game to get a FREE ticket when you buy one. Offer valid from now until September 7, 2010. Offer is unavailable in Allentown, Dayton, Indianapolis, Lansing, Montgomery, Pasco, Reno, Spokane, Tacoma or Vancouver. Go here to see the full details and a schedule of the games.